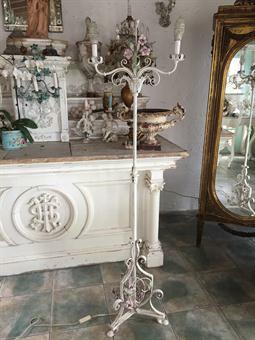 THIS ELEGANT FLOOR LAMP DATES FROM THE 1940''S ERA AND FEATURES AN ORNATE IRON FRAME WITH TINY FLORALS AT THE TOP AND BASE. 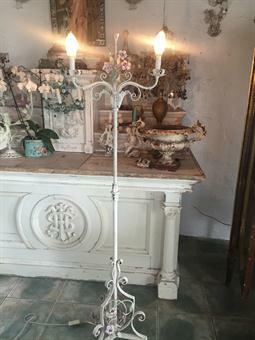 TWO LIGHTS BOTH WITH VINTAGE BEADED SHADES. 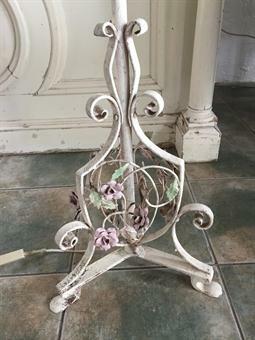 LAMP MEASURES 65'' TALL X 18'' WIDE.